Researchers from the University of Barcelona in collaboration with a team from the Zoological Station Anton Dohrn (Italy) have analysed the impact of diatom algae in the development of Oikopleura dioica (O. Dioica), a type of marine zooplankton invertebrate which plays an important role in the global dynamics of the marine food webs and the biosphere carbon cycle. The results, published in the new scientific journal from the group Nature Communications Biology, show that biotoxins that are produced by these algae at the end of the blooms can affect the embryonic development, and therefore the reproduction of this species, with severe ecological consequences. The study, led by UB lecturers Ricard Albalat and Cristian Cañestero from the Department of Genetics, Microbiology and Statistics and members of the Biodiversity Research Institute (IRBio) of the UB, is especially relevant considering that ocean acidification and warming caused by climate change could intensify the frequency of blooms in harmful algae like diatoms. The following UB researchers also took part in the research study: Núria P. Torres-Águila -first signer of the study-, Josep Martí Solans, Alfonso Ferrández, Alba Almazán and Vittoria Roncalli. Diatoms are a type of microalgae that contribute to the marine phytoplankton photoautotrophic production, since these provide nutrients to all other forms of life out of solar light. However, diatoms can produce biotoxins (polyunsaturated aldehydes) as a defence mechanism against its predators, such as small crustacean like copepods. These substances are massively released at the end of the blooms and can alter the biology of marine animals in the area. The new study has analysed the impact of these biotoxins in the development of O. dioca, a type of marine invertebrate belonging to the appendicularian chordates (Appendicularia or Larvacea). Appendicularians are key organisms in the ocean food web, since they process about 10 % of the primary production in the ocean and serve as food for fish larvae in the marine trophic chain. "Results show that biotoxins that are produced by diatoms can cause important alterations in the development of O. dioica inducing a phenotype they call 'golf ball' which affects the embryo morphogenesis and differentiation of their trunk and tail", says Cristian Cañestero. Moreover, the study reveals these effects take place even in concentrations of the same magnitude order than the ones measured in the sea after diatom blooms. "Although in our study embryonic malformations appear in high concentrations than the ones found in natural conditions, we have also observed lethal embryonic anomalies at similar concentrations to the measured values in nature after blooms", says the researcher. This discovery is especially relevant considering the increase of acidification and warming in the oceans due climate change could intensify the seriousness and frequency of algae blooms. "Discovering how blooms in harmful algae and the massive production of toxins can alter the physiology of larvae is important due its impact in the marine food web and to predict future problems in fishing caused by global climate change", notes the researcher. The study also analysed the genic response of O. dioica to the impact of biotoxins. "We found that O. dioica can respond to the stress caused by diatoms by delaying the zygotic transcription of the development genes during the first stages and activating defensive genes (set of genes that protect the cell against environmental attacks), even in innocuous concentrations of biotoxins in which we did not observe any embryonic alteration", says Cristian Cañestero. According to the conclusions of the study, this response could be part of a mechanism developed over the evolution that protects embryos from environmental dangers and which would serve as a potential biomarker. "Defensive genes would be a molecular biosensor that marine ecologists could use to control the genetic stress in natural populations of appendicularians, and other organisms, exposed to algae blooms in their habitat, and afterwards, assess the potential impact of blooms associated with climate change", highlights the researcher. These results open a new study area for the UB research team. 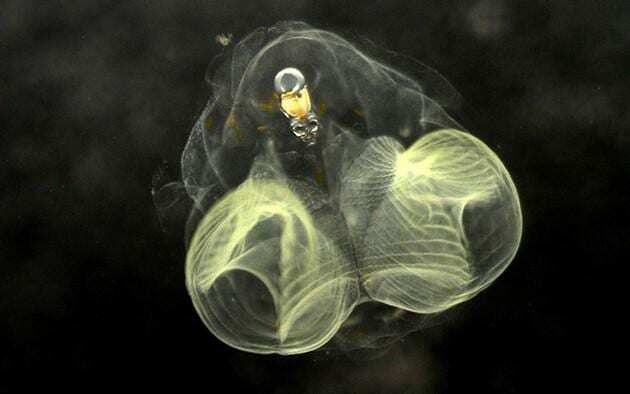 "The article brings the basics of a new research line in the EcoEvoDevo field, the intersection between Ecology, Developmental Biology and Evolution, which will do research on whether the embryos of marine organisms are ready to respond to climate change", concludes Cristian Cañestero.